Home Page, 13th September 2013: click for today’s. This post describes the making, distribution and creative use of reusable shopping bags for followthethings.com, a ‘shopping’ site, if you understand shopping to involve betraying the origins of things, like you might ‘shop’ a person to the police. 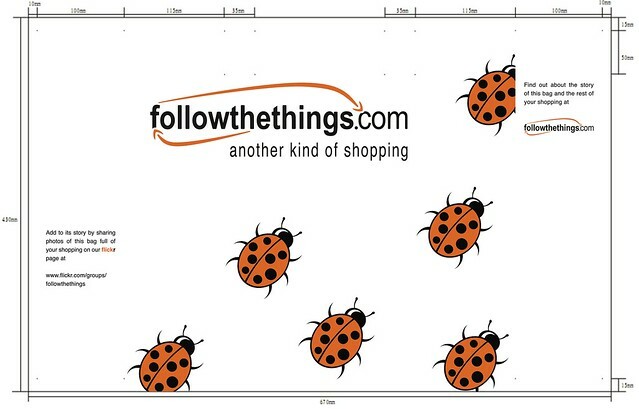 followthethings.com is designed to have the look, feel and architecture of familiar online stores. It’s stocked with examples of art work, documentary film, journalism, activism, academic, student and other work revealing the lives of everyday things, i.e. the relations between their producers and consumers hidden by commodity fetishism. It shows how their makers tried to make these relations apparent, visible, tangible in ways that might move their audiences to act by trying to make them feel guilty, shocked, appreciative, awkward and/or involved in other people’s lives and work. 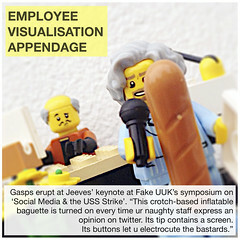 It aims to inform and inspire new creative commodity activism. Our shopping bags are one example. followthethings.com is a massive collaborative project, which I ‘orchestrate’. Undergraduate students research most of its pages, and some have been employed as interns to work on the site. Daisy Livingston was one. 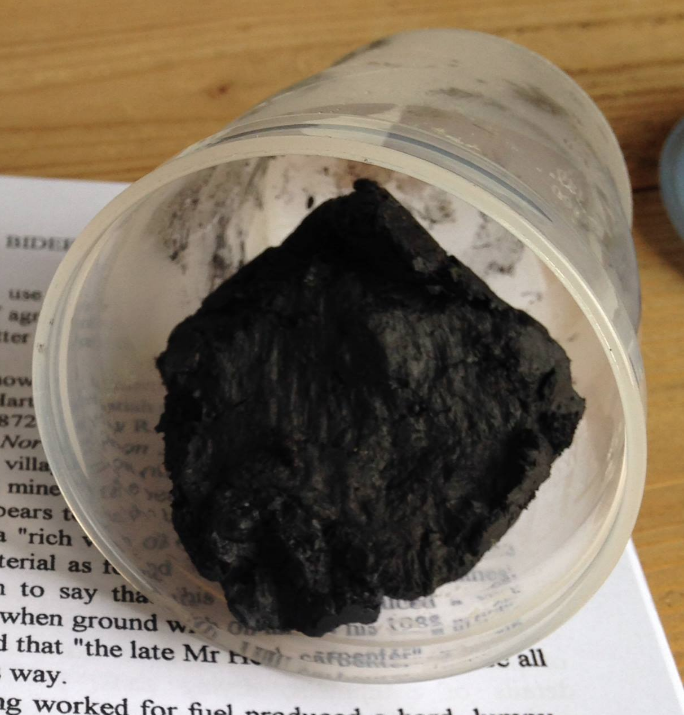 In January 2011, she submitted a cotton shopping bag and some documents as her ‘Geographies of Material Culture’ coursework. She’d had a batch made in a factory in China. The documents were the shipping documents and printouts of email conversations she’d had with factory staff. This was the most brilliant coursework I had ever seen. Daisy worked as an intern that summer and I asked her and 4 other interns to design and order some followthethings.com shopping bags, just as she had done before. We searched for shopping bags on alibaba.com, searched through hundreds of bag photos, clicked the ones we recognised, and ended up on pages naming and providing the addresses of factories where they were made, saying how much they cost and who to talk to about placing an order. We designed a bag that could be easily mistaken for a mainstream supermarket bags, using similar colours and insects. We ordered 5,000 from a company in China to the exact specification of a ‘pp woven’ bag we knew they had made for Sainsbury’s. To assure us that their bags weren’t made in a ‘sweatshop’, they sent us factory audits conducted according to the Ethical Trading Initiative’s Base Code. The facts and figures were fascinating, but the reports also had pages of colour photos illustrating the auditors’ observations: an emergency light and exit sign, some drinkable water, a first aid box, people working in the coating, cutting, printing, sewing and packing workshops and the room where pallets were stacked with boxes before dispatch. When one auditor visited, they were clearly making Sainsbury’s distinctive Elephant bags. There’s only so much you can learn from examining one of these bags at home. We wanted to learn by designing and having our own made (cf Ingold 2007, Hawkins 2011, Last 2012). @followthethings shopping bags on Cosco Pacific, next stop Yantian, 10km from downtown Shenzhen. Now following via MarineTraffic iPad app. 2007 story on crane operators’ strike at Yantian port: http://t.co/aOp78bB0 includes v. brief insight into port workers’ lives & concerns. The Cosco Pacific left Qingdao port on September 19, docked at Yantian (where, for example, crane operators had been on strike in 2007). It entered Singapore Harbour (where, for example, two Bangladeshi port workers has been found alive and dead in a container in 2011). It then sailed along the Malacca Strait, across the Indian Ocean, past the Southern tip of India and Sri Lanka, through the Suez Canal and into the Mediterranean, out into the Atlantic, along the English Channel, to Rotterdam, then Felixstowe (where, for example, the UNITE union were attempting to organise truck drivers operating out of the docks in 2011 and the port was expanding). Our bags were unloaded and trucked from here, and the Cosco Pacific then sailed on to Hamburg and continued its journey. Our bags were finally delivered to us by truck on October 29 2011, unloaded by the driver and his mate at the back door of the Amory Building at the University of Exeter’s Streatham campus. We opened the boxes to see what we’d designed in their full, realised, ‘pp woven’ glory. The first bag out of the box, 29 October 2011. 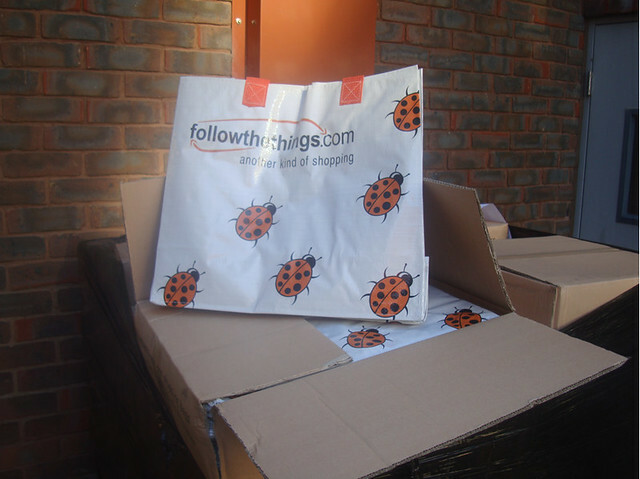 The first bagful of followthethings research, posted on flickr. This exemplar bag had school shirts from Marks & Spencer, a Tangle Teezer hair brush, Moshi Monsters trading cards and a Spongebob magazine. Added below the photo were links to a 2011 online magazine article about Marks & Spencer’s use of fair trade cotton and a 2007 ActionAid report critical of school uniform supply chain; a 2011 online newspaper report about the Tangle Teezer’s failure to gain financial support on TV’s Dragon’s Den; and 2011 online newspaper reports about the takeover of the magazine’s publisher by venture capitalists and their subsequent winding up of workers’ pension scheme. The point that this ‘bagful’ photo and research was supposed to illustrate was that, within even the most innocent commodity, there are hidden stories of labour that can, relatively easily, be found and published online (Cook et al 2007) by people working not only at followthethings.com HQ but also at 3,000+ other locations (and counting) worldwide. Ladybird yarnbombing at the University of Exeter: 21st March 2012. That was not all… In January 2012, a craft group started meeting in the cafe along the corridor from my office in the Amory Building, which was linked to an AHRC-funded research project on Craft Geographies. Academic staff, postgrads, technical staff and others came along to talk and knit. I’m not a knitter, but I donated a box of 50 shopping bags as ‘craft materials’ and went to the meetings to join in the conversation. We discussed what we should do for international yarnbombing day – the first day of Spring – and ended up knitting and cutting out of our bags a large number of ladybirds to yarnbomb the entrance to the Amory Building (craftgeographies 2012a). These ladybirds, bags and other materials, images and stories fired our imaginations, mischievously, hilariously and, we thought, with some critical purpose in which our ‘shoppers’ might enjoy participating (cf Treadaway 2009; Merrifield 2011; Cook & Woodyer 2012, Woodyer & Geoghegean 2012). 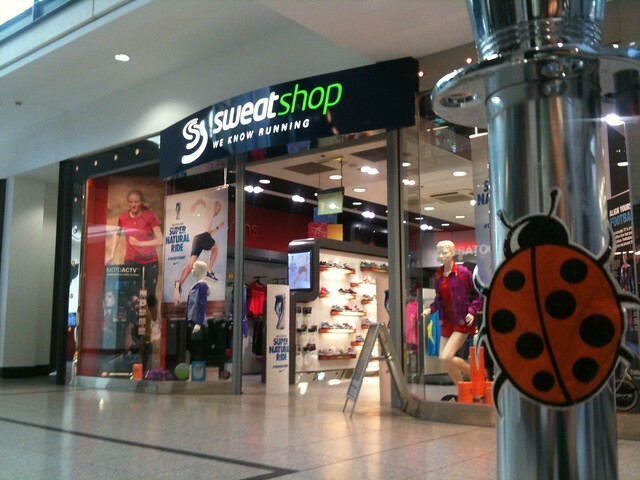 The ‘sympathetic character’ at the centre of our action would not a person but a ladybird (Canning & Reinsborough 2012). In its short life, each of our pp woven insects had witnessed global trade first hand, met factory workers, dock and ship workers, truck drivers and their mates, all over the world. They knew about world trade and exploitation and their experiences had given them powerful bugging capabilities. Released from the bags, and out in worlds of shopping, she (and sometime he) would watch, learn and wonder. Merrifield, A. (2011) Magical Marxism: subversive politics and the imagination. London: Pluto Press. Thanks to Daisy Livingston, Aiden Waller, Jack Parkin, Emma Christie-Miller, Alice Goodbrook, Doreen Jakob, Angela Last, Tara Woodyer, Chris Bear, Sarah Mills, Amanda Rogers, Becky Sandover, Mia Hunt and one anonymous ACME referee for helping to shape the arguments made here. Written by Ian Cook et al Posted in activism, Appreciation, art, China, conference bags, Container ship, Cosco Pacific, craft, Education, Flickr, followtheteachers, followthethings.com, Geography, Imagine, ladybirds, ladybugging, Manufacture, mission:explore, missions, new work, out & about, photo, Shopping bags, student work, sweatshop, Teaching resources, things, University of Exeter, video, Where does our stuff come from?